Wallis and Futuna, officially the Territory of the Wallis and Futuna Islands  ( /ˈwɒlɪs ... fuːˈtuːnə/; French: Wallis-et-Futuna [walis.e.fytyna] or Territoire des îles Wallis-et-Futuna, Fakauvea and Fakafutuna: Uvea mo Futuna), is a French island collectivity in the South Pacific between Tuvalu to the northwest, Fiji to the southwest, Tonga to the southeast, Samoa to the east, and Tokelau to the northeast. Though both French and Polynesian, Wallis and Futuna is distinct from the entity known as French Polynesia. Its land area is 142.42 km2 (54.99 sq mi) with a population of 11,558 at the 2018 census (down from 14,944 at the 2003 census). Mata-Utu is the capital and biggest city. 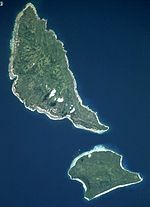 The territory is made up of three main volcanic tropical islands along with a number of tiny islets, and is split into two island groups that lie about 260 km (160 mi) apart, namely the Wallis Islands (Uvea) in the northeast, and the Hoorn Islands (also known as the Futuna Islands) in the southwest, including Futuna Island proper and the mostly uninhabited Alofi Island. 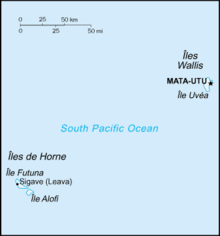 Since 2003, Wallis and Futuna has been a French overseas collectivity ( collectivité d'outre-mer, or COM). Between 1961 and 2003, it had the status of a French overseas territory ( territoire d'outre-mer, or TOM), though its official name did not change when the status changed. Polynesians settled the islands that would later be called Wallis and Futuna around the year 1000 AD/CE, when the Tongan Empire expanded into the area. The original inhabitants built forts and other identifiable ruins on the islands, some of which are still partially intact. On 5 April 1842, the missionaries asked for the protection of France after the rebellion of a part of the local population. On 5 April 1887, the Queen of Uvea (on the island of Wallis) signed a treaty officially establishing a French protectorate. The kings of Sigave and Alo on the islands of Futuna and Alofi also signed a treaty establishing a French protectorate on 16 February 1888. The islands were put under the authority of the French colony of New Caledonia. In 2005, the 50th King of Uvea, Tomasi Kulimoetoke II, faced being deposed after giving sanctuary to his grandson who was convicted of manslaughter. The King claimed his grandson should be judged by tribal law rather than by the French penal system. There were riots in the streets involving the King's supporters, who were victorious over attempts to replace the King. Two years later, Tomasi Kulimoetoke died on 7 May 2007. The state was in a six-month period of mourning. During this period, mentioning a successor was forbidden. On 25 July 2008, Kapiliele Faupala was installed as King despite protests from some of the royal clans. The capital of the collectivity is Matāʻutu on the island of Uvéa, the most populous of the Wallis Islands. As an overseas collectivity of France, it is governed under the French constitution of 28 September 1958, and has universal suffrage for those over 18 years of age. The French president is elected by popular vote for a five-year term; the high administrator is appointed by the French president on the advice of the French Ministry of the Interior; the presidents of the Territorial Government and the Territorial Assembly are elected by the members of the assembly. The head of state is President Emmanuel Macron of France as represented by the Administrator-Superior Thierry Queffelec. The President of the Territorial Assembly is Petelo Hanisi since 11 December 2013. The Council of the Territory consists of three kings (monarchs of the three pre-colonial kingdoms) and three members appointed by the high administrator on the advice of the Territorial Assembly. The legislative branch consists of the unicameral Territorial Assembly or Assemblée territoriale of 20 seats; the members are elected by popular vote to serve five-year terms. Wallis and Futuna elect one senator to the French Senate and one deputy to the French National Assembly. Justice is generally administered under French law by a tribunal of the first instance in Mata-Utu, but the three traditional kingdoms administer justice according to customary law (only for non-criminal cases). The Court of Appeal is in Nouméa, New Caledonia. The territory participates in the Franc Zone, and as a permanent member of the Secretariat of the Pacific Community and as an observer of the Pacific Islands Forum. 13°18′S 176°12′W﻿ / ﻿13.300°S 176.200°W﻿ / -13.300; -176.200, (225 mi west of Samoa and 300 mi (480 km) north-east of Fiji). The territory includes the island of Uvéa (the most populous), the island of Futuna, the essentially uninhabited island of Alofi, and 20 uninhabited islets, totaling 274 square kilometres (106 sq mi) with 129 kilometres (80 mi) of coastline. The highest point in the territory is Mont Puke (on the island of Futuna) at 524 metres (1,719 ft). The islands have a hot, rainy season from November to April with associated storms caused by the passage of tropical cyclones over the islands. There is a cool, dry season from May to October caused by the predominance of the south-east trade winds during this time. Average annual rainfall is 2,500 to 3,000 millimetres (98–118 in) with rainfall likely on at least 260 days each year. The average humidity is 80% and the average temperature is 26.6 °C (79.9 °F), rarely falling below 24.0 °C (75.2 °F) and ranging between 28.0 °C (82.4 °F) and 32.0 °C (89.6 °F) during the rainy season. Only five percent of the islands' land area is arable land; permanent crops cover another 20%. Deforestation (only small portions of the original forests remain), largely as a result of the continued use of wood as the main fuel source, is a serious problem; as a consequence of cutting down the forests, the mountainous terrain of Futuna is particularly prone to erosion. There are no permanent settlements on Alofi because of the lack of natural freshwater resources. The GDP of Wallis and Futuna in 2005 was 188 million US dollars at market exchange rates. The territory's economy is limited to traditional subsistence agriculture, with about 80% of the labor force earning its livelihood from agriculture ( coconuts and vegetables), livestock (mostly pigs), and fishing. About 4% of the population is employed in government. Revenues come from French government subsidies, licensing of fishing rights to Japan and South Korea, import taxes, and remittances from expatriate workers in New Caledonia, French Polynesia and France. Industries include copra, handicrafts, fishing, and lumber. Agricultural products include coconuts, bread fruit, yams, taro, bananas, pigs, and fish. In 1991, BNP Nouvelle-Calédonie, a subsidiary of BNP Paribas, established a subsidiary, Banque de Wallis-et-Futuna, which currently is the only bank in the territory. Two years earlier Banque Indosuez had closed the branch at Mata-Utu that it had opened in 1977, leaving the territory without any bank. Many exports include copra, chemicals, and fish. The total population of the territory at the July 2018 census was 11,558 (72.1% on the island of Wallis, 27.9% on the island of Futuna),  down from 14,944 at the July 2003 census. The vast majority of the population are of Polynesian ethnicity, with a small minority of Metropolitan French descent and/or native-born whites of French descent. The culture of Wallis and Futuna is Polynesian, and is very similar to the cultures of its neighbouring nations Samoa and Tonga. The Wallisian and Futunan cultures share very similar components in language, dance, cuisine and modes of celebration. In 1994, the territory had 1,125 telephones in use, had one AM radio station, and two television broadcast stations[ citation needed]. Communication costs are high, costing up to ten times as much[ citation needed] as western countries. The island of Wallis has about 100 kilometres (62 mi) of roadways, of which 16 are paved, while the island of Futuna has only 20 kilometres (12 mi), none are paved. The territory has two main ports and harbours, Mata-Utu and Leava (on the island of Futuna), that support its merchant marine fleet consisting of three ships (two passenger ships and a petroleum tanker), totaling 92,060 GRT or 45,881 tonnes. There are two airports, Hihifo Airport on Wallis with a paved runway of 2.1 kilometres (1.3 mi), and Pointe Vele Airport on Futuna with a 1 kilometre (0.62 mi) smaller runway. New Caledonia-based Aircalin operates the only commercial flights that go to Wallis, where it has an office in Mata-Utu. There are currently no commercial boat operators. The territory's data code and country code (top level Internet domain) is .wf. Currently this is suspended in favor of the .fr and .nc (Nouvelle Calédonie) data code. ^ a b "The World Factbook — Central Intelligence Agency". www.cia.gov. Retrieved 14 April 2018. ^ a b c INSEE. "Les populations légales de Wallis et Futuna en 2018". Retrieved 7 April 2019. ^ a b c INSEE, CEROM. "L'économie de Wallis-et-Futuna en 2005: Une économie traditionnelle et administrée" (PDF) (in French). Archived from the original (PDF) on 9 September 2008. Retrieved 1 July 2008. ^ Loi no 61-814 du 29 juillet 1961 conférant aux îles Wallis-et-Futuna le statut de territoire d'outre-mer (in French). ^ a b c INSEE. "Wallis et Futuna a perdu près du cinquième de sa population en dix ans" (in French). Retrieved 7 April 2019. ^ "POP Culture: Wallis and Futuna". Guampedia. Retrieved 3 March 2017. ^ "Wallis and Futuna Islands". InfoPlease. Retrieved 14 April 2018. ^ BBC News (1 June 2007). "Been and gone – fit for a King". Retrieved 3 June 2007. ^ "France appoints new prefect of Wallis and Futuna". Radio New Zealand. Retrieved 27 January 2019. ^ ISEE. "L'évolution de la population par communauté d'appartenance". Retrieved 7 April 2019. ^ INSEE. "Wallis et Futuna - Recensement de la population". Retrieved 7 April 2019. ^ a b c STSEE. "Les premiers résultats du recensement de la population 2018 - Principaux_tableaux_population_2018" (ODS) (in French). Retrieved 7 April 2019. ^ a b c INSEE, Government of France. "Tableau Pop_06_1 : Population selon le sexe, la connaissance du français et l'âge décennal" (in French). Archived from the original (XLS) on 7 April 2019. Retrieved 3 October 2009. ^ a b c d INSEE, Government of France. "Tableau Pop_06_1 : Population selon le sexe, la connaissance du français et l'âge décennal" (XLS) (in French). Retrieved 3 October 2009. ^ a b Ibpus.com; International Business Publications, USA (1 January 2012). Wallis & Futuna Business Law Handbook: Strategic Information and Laws. Int'l Business Publications. pp. 37–. ISBN 978-1-4387-7141-0. Retrieved 9 May 2013. ^ Hinz, Earl R.; Howard, Jim (2006). Landfalls of Paradise: Cruising Guide to the Pacific Islands. University of Hawaii Press. pp. 220–. ISBN 978-0-8248-3037-3. ^ Dominik Maximilián Ramík (26 May 2009). "Futuna - přílet z Wallisu - Flying to Futuna Island (from Wallis)". Retrieved 14 April 2018 – via YouTube. ^ a b " LIVRET D'ACCUEIL Wallis et Futuna." Wallis and Futuna. p. 22 (22/28). Retrieved on 14 September 2016. ^ " Cartographie des établissements du second degré." Wallis and Futuna. 24 June 2016. Retrieved on 14 September 2016. Look up Wallis and Futuna in Wiktionary, the free dictionary. 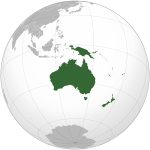 Wikimedia Commons has media related to Wallis and Futuna. Wikivoyage has a travel guide for Wallis and Futuna.